19 Nov 2018 --- While UK political uncertainty in the wake of the Brexit withdrawal agreement formed with the EU last week has subsided somewhat since last Thursday’s drama, scare stories about the immediate impact on a “no deal” Brexit on the food industry have intensified. These range from genuine industry concerns about a lack of available warehousing for the stockpiling of ingredients, packaging and product, to hyped fears about a complete interruption to the availability of Mars bars in the country. Last Wednesday night, after months of negotiations, UK Prime Minister Theresa May secured the support of her cabinet for the Draft Withdrawal text. 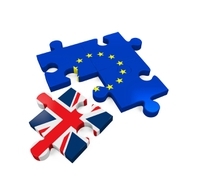 The food and beverage industry has been closely monitoring the situation and has repeatedly called for clarity on what should be expected to happen once the UK finally leaves the EU on March 29, 2019 and beyond. Claiming the draft text would allow the UK to leave the EU “in a smooth and orderly way,” the PM says that although it’s not a finalized agreement, it brings the UK closer to securing a deal. The other option of a “no-deal” scenario, of course, is for the UK to exit the EU without a deal and revert to World Trade Organization rules. This is a very significant time in the Brexit process with UK ministers deciding the draft text and EU Member States also considering the terms of the prospective deal. An emergency meeting of EU leaders in Brussels is scheduled for November 25, when the withdrawal agreement will be finalized and formalized. This latest development has sparked a flurry of responses from the UK and European food industry organizations who have been watching Brexit events unfold ever since the Referendum in 2016. The Food and Drink Federation (FDF) says “uncertainty remains.” FDF Chief Executive, Ian Wright CBE said retailers were pressing ahead with contingency planning for stockpiling because it was prudent to do so. The FDF has previously warned that the shadow of a “no deal” Brexit looms large over business confidence among the UK's food and drink manufacturing industry because there are so many crucial questions to which businesses need answers. During a roundtable meeting last week, representatives from the FDF told Michael Gove that the iconic UK Mars bar could go extinct within a fortnight, as well as all confectionery imports to the country. These types of products will have to dramatically increase in price if the UK can't strike a deal with Brussels. The debate led to a wave of hyped headlines about a Mars bar shortage. In August, the FDF published the second of its new quarterly business confidence surveys revealing that more than three-quarters of manufacturers expected input prices to rise in the remainder of 2018. More than half of those polled had seen increased ingredient costs (62 percent), increased packaging costs (61 percent) and increased energy costs (51 percent) having the most significant impact on their businesses in the second quarter of the year. On the bright side, 54 percent of businesses had also seen an increase in sales in the UK, while 42 percent reported an increase in new product launches. In September, a report from Barclays calculated widespread disruption and price hikes with the “Hard Brexit” model forecast to create an average tariff of 27 percent for food and drink supply chains which is significantly more than the 3-4 percent levy that would hit non-food products. FoodDrinkEurope declined to comment on these developments when asked by FoodIngredientsFirst. The British Retail Consortium has also been calling for clarity for some time and claimed that a “no deal” Brexit could lead to severe food price hikes with items like cheese, beef and fresh produce being among the worst affected. A statement from Helen Dickinson, BRC Chief Executive, reiterates the need for clarity: “Until an agreement is approved by both Parliament and EU Member States, we have continuing uncertainty and the risk remain of consumers facing higher prices and reduced availability of products in March 2019. We need to secure a withdrawal agreement that can protect frictionless, tariff-free trade throughout the transition period,” it says. European agricultural group, Copa-Cogeca has a different stance, welcoming this initial deal as an essential step towards an orderly Brexit, that would further minimize the prospect of a “no-deal” scenario which, it claims, would be catastrophic for both EU and British farmers and agri-cooperatives. It cites progress in two key issues; the Irish border compromise and that recognition of the existing stock of EU approved geographical indicators would be legally protected by the current withdrawal agreement. Both the UK and EU want to avoid a hard border, which would mean checks between Northern Ireland and Ireland. The draft agreement includes a “backstop” to make sure there is no hard border whatever the outcome of future trade talks between the UK and the EU. It means that Northern Ireland would adhere to some rules of the EU single market if there is no other solution found before the end of the official transition period, which in that scenario would last until December 2020. “There is still work to do and uncertainty in the negotiations on the future of our relationship with the UK, but we should welcome this first outcome and the commitment of negotiators and governments on all sides,” says Pekka Pesonen, Copa-Cogeca, Secretary-General. The National Farmers’ Union of England and Wales have called on UK and EU leaders to work together to finalize a Withdrawal Agreement to ensure continued free and frictionless trade after the UK leaves in four months time. “It is critical that we avoid the mayhem of a ‘no-deal’ Brexit in March of next year, and this withdrawal agreement paves the way for a transition period that maintains free and frictionless trade with the EU and provides stability for farmers and the wider economy,” says NFU President, Minette Batters. “The customs arrangements are barely there in legal terms, the structures for them certainly are not, and the ‘deal’ has to be agreed by a split UK Parliament – and 27 other states,” she says. “The negative impact will be immediate. Any benefits, such as new trade treaties are at least two years away. A soft pound will make UK exports cheaper but the UK is not a major food exporter, either commodities or finished products. The loss of European workers is already having an impact on agriculture and the food industry, which is likely to increase costs or cause loss of businesses. The rapid and as yet unclear change in trading rules, changes in supply chains and problems with staffing will make some businesses vulnerable,” she says. Johnston also notes the connection with logistics and how the days of cheap long-haul transport may be ending for many reasons. That issue applies to trans-oceanic container traffic as well. She asks how can supply chains be proofed against disruption as energy costs rise and demand diverts exported supplies from Europe to domestic markets in Asia? She concludes by stressing that if “cheap food” is no longer possible, has a bad reputation and leaves the industry financially vulnerable, another mode is requiredl. “But ‘expensive’ food without quality or other positive attributes is not the alternative,” she concludes. Not ruling out a sudden political fallout, with more MP resignations and calls for a vote of no confidence in the UK Prime Minister, the next steps involve the emergency meeting scheduled for later this month. Without clarity, the Brexit uncertainties are likely to dominate the headlines for months to come. Brexit UK European Union Food And Drink Federation British Retail Consortium Copa-Cogeca Trade Exports Imports Border Tariffs Innova Market Insights.